For a little over five years we have used our American Express card to pay for everything. We have done our research on rewards programs and the options offered by Amex were by far our favorite, not to mention the long list of other benefits of being a card member. We have used Amex rewards to purchase a refrigerator from Home Depot, to buy a television through Amazon, to book rental cars, and more! The amount of money we have saved is amazing and they just keep giving me more reasons to love them. My new favorite way to save money is with Amex Offers. I first started using the offers that were available to me when I logged on to my account. When I would get online to look at my transactions or pay my bill I would check out the offers tab and select any that applied to me. 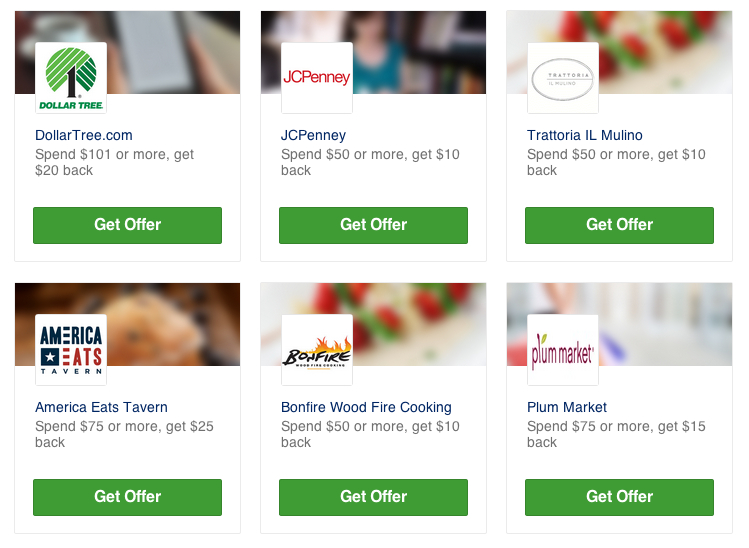 I have been using these offers for a long time, but it wasn't until this summer that I found out there are even more offers available through social media! I have connected my Amex card to my Facebook and Twitter account and now have access to all of the Amex Offers there too. I no longer have to login to my Amex account; I can just check out the Offers on my Facebook and Twitter app on my phone. I select them there and the Offers are saved to my card. Once I make my purchase the credits show up in the same way. You can check for Amex Offers on Foursquare and TripAdvisor too! What makes it even better is that I don't have to weed through a lot of offers that aren't relevant to me. Amex Offers curates a list for me based on where I have used my card and my current location. I can then use them right away and save money on things I was already going to buy! And there are a ton of great offers. Card Members have saved over $90 million so far and right now there are more savings to be had with current offers on purchases from places like JCPenney, Sports Authority, and Crazy 8. I don't know about you, but with school starting next month I feel like I am shopping non-stop. It will be nice to open my Amex bill and see all of the credits from the Amex Offers I have used! And because I know once I have saved the offer I will get a $10 credit for spending $50 at Sports Authority (7/28-8/31/14), that gives me $10 more to spend on school shoes! You should give Amex Offers a try while you are out doing your back to school shopping and if you leave a comment below and let me know what you like most about Amex Offers, you will be entered to win a $100 AMEX gift card! Then you can buy yourself a little back to school present! This sweepstakes runs from 8/4-9/1. Be sure to visit the Amex Offers brand page on BlogHer.com where you can read other bloggers’ posts! I'm a recent user of Amex Offers! I wish I had been paying attention sooner. I like that is was so easy to use (I used an offer at Costco). I love that the offers are ones that families can really use, at places we love! I like that the offers are relevant to where you’ve shopped in the past and your current location. I like that you can open the Amex app on your phone, and tap a button to see retail offers that are available in your area nearby. Very cool! I like the cash back offers for stores I already shop at often and that I would not need to carry coupons. I like that I can use it at stores I always shop and for things that I really need! i like that there are many deals in many categories to choose from; you can find some deal you could take advantage of. i like all the different stores you can shop at, especially best buy which is our favorite!! Love that they give you offers based on where you shop at. amazing!!! I like that you can just put the coupon code on the card you do not need to bring a physical coupon with you. I love my American Express, and wasn't even aware of the offers! I love how convenient they make it to save. Thanks for sharing! I definitely like the no clipping coupons or trying to find coupon codes! i love that i can earn cash back almost anywhere! I love the fact that American Express offers are so easy to use. With the phone app, there is no reason not to use them! I like that you can open the Amex app on your phone, and tap a button to see retail offers that are available in your area nearby, I don’t have to carry coupons or remember a code. Definitely like the cash back offers! I like that there are many offers that I’m actually interested in, like JCPenney and Whole Foods. I love the simplicity the most, but the variety of stores and great offers are fantastic! I like that the Amex Offers are pertinent for my family--especially for BTS shopping! I like Amex offers are always ready whenever I log into my account. I like Amex Offers because they have so many for the stores I already like. I like that they offer deals from popular stores I shop at! I like the offers are for stores I actually shop at! My favorite thing about Amex offers is that it automatically credits my account after redeeming the deal. It also sends an e-mail alert, which keeps me informed that it went through! My favorite thing about these offers is that they credit your account right away. I like that you don't have to print a coupon but still get a good deal. There's a great variety of stores! I like that they have numerous offers and for many stores that I already frequently shop at like whole foods and amazon. I love that it customizes offers for you based on where you shopped in the past! I also love you can connect your card to social networks! I like the selection of stores where I can use the offers. I love the types of stores they have discounts for. I like that they have restaurant deals. I like that the offers are relevant to what I am already buying. I love the special offers and how easy it is to use! There are so many options for savings and you don't have to worry about using coupons or rebates! cheesecake factory - perfect for first day of school celebration! I don't have one of these cards, but it sounds like they help you save money. I like the cash back. I like that you don't have to clip coupons or watch ads for special deals. They are right on your phone. I enjoy how easy it is to add offers to my phone - thank you. I like you don't need coupons. I like that I do not have to carry coupons with me. I love the great deals. My favorite is the $20 back when you spend $40 at Amazon. That is an awesome deal. I like that i don't have to clip coupons to save money. the twenty back on 40 at amazon the best out there i use amazon ALOT! I like that they have an Iphone app. I can get them from various sites. I love that you don't have to clip coupons. What I like most is I can view all of the offers right on my phone. I like the cash back offers. I shop at JCPenney a lot, and this would save me a lot! I love the cashback offer for JCPenny.... and you can combine with coupons! I like that I do not have to print coupons. Cash back on amazon is nice. I like the Amazon offer, I love to shop there. I Love that its great deals that are easy to take advantage of at place I alredy shop! I like that they have a variety of stores they have offers for! I like how easy it is to get my annual fee paid off. The offers pay for it each year! I like that I can save money with a reward instead of have to print or clip coupons. I love the Amazon offer. I love all the different offers they have. I don't have a smart phone so I can't get offers spur of the moment in stores. This is a great idea. I have american express and had no idea about this! Thanks! I like that it requires very little work. I always hunt for coupons before going shopping but I wouldn't really have to with this. thank you! I love that is geared toward my shopping habits! I love how easy it is to save money! No coupons, no cutting, just simple easy! I love that all the deals are for places I already shop! I like that it's a no-brainer. Sign up and BOOM...there are the rewards on your statement. No coupons to clip, just easy! I like that they are "real" coupons with offers that I can use. I LOVE THE AMAZON OFFER! I love deals via social media. New AmEx user and quite pleased. The newest edition, Bluebird services especially.